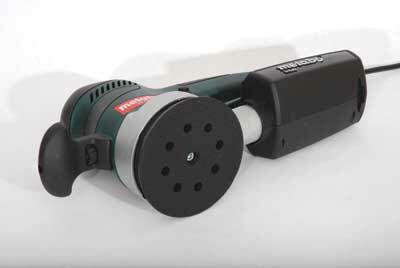 The new Metabo 450 Duo random orbit sander tested a while back proved to be a worthy successor to the old one despite a smaller motor and some other design changes. Launched at the same time, the 425 sander has a 125mm-diameter base rather than the 150mm of its sibling, less power and no dual-orbit action. However, it has the same German build quality, Intec dust collection system and the Turbo boost. But it is lighter, smaller and cheaper. I used it while finishing a couple of small tables in oak and sycamore. The bulk and weight of a bigger sander was not missed, but the power and turbo efficiency were very effective in providing a smooth surface ready for finishing. In the absence of vacuum extraction the Intec dust collection system is about as good as it gets. 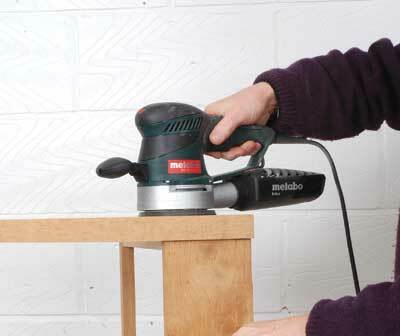 While it is very handy to have the Duo's ability to remove stock fast, if the sanding surface has already been flattened with a belt sander, say, the 425 will quickly provide a smooth finish. It handled well and the rubberised grips helped damp vibration to the hands as well as providing positive grip. Noise levels are very acceptable and the wide range of speeds available means that the sander can be used on plastics and metals as well as for polishing the car. Similar sanders would have to be pretty good to match up to the Metabo SXE 425 TurboTec. It has a solid build quality and reassuring ability to keep working day after day. Combine these with good dust collection, versatility and the Turbo feature and it's a winning formula. "It has a solid build quality and reassuring ability to keep working day after day"